The match between Manchester United and Stoke City promised to be one of the most interesting tactical battles of the weekend, with two predictably different approaches. 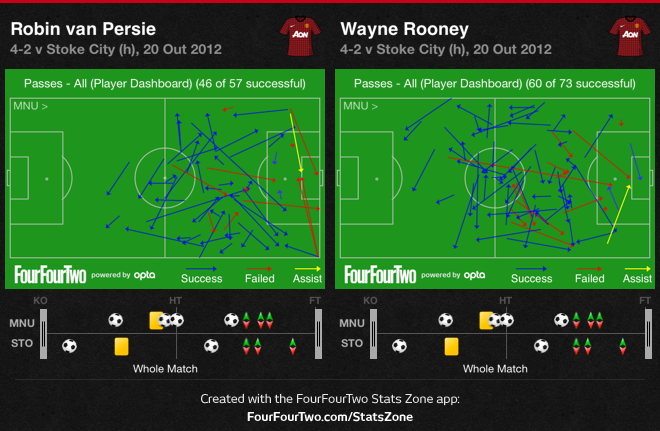 There were even some doubts as to whether Manchester United would be able to counter Stoke's aerial threat. The most obvious way (and a cliché by now) of telling Stoke City apart from almost every other team is by analysing the passes in the attacking third. With Peter Crouch on his side, Tony Pulis doesn't have any second thoughts about whether to stick to route one football, even more so against stronger opponents. 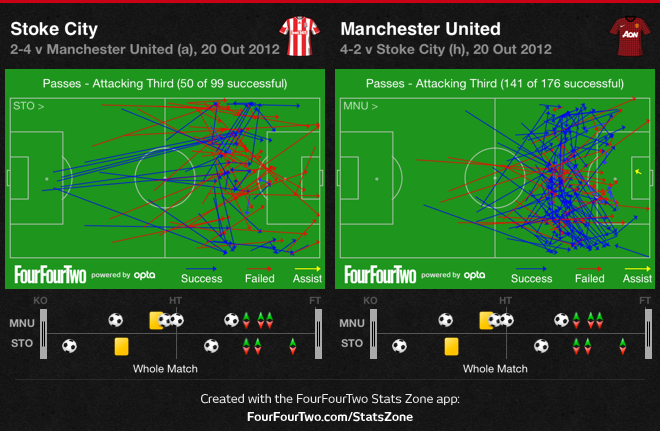 As for United, their intricate passing eventually worked out and ended up determining the result. Stoke's approach was rather simple - but effective: get the ball out to Crouch (particularly on Ferdinand's side), who would then flick it onto Kightly or Walters - Crouch's knack at linking up play is often underrated. Most likely aware of both Ferdinand and Evans' difficulties in the air and Scholes and Carrick's lack of pace to win second balls back, the away team insisted on executing that play time and again. Pulis' men would remain compact in a 4x1x4x1 - not too withdrawn, unexpectedly - and sought to pounce on United when they tried to bring the ball into the centre, and break quickly. Stoke city's tackles and interceptions, mainly down the left. 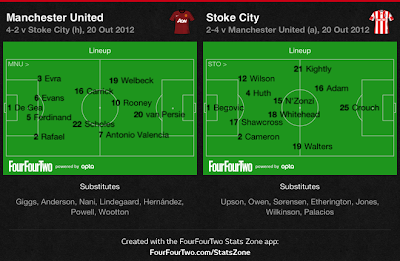 Besides, with Valencia and Welbeck lingering up front and Rooney higher than usual, Stoke's wingers came inside at will, confusing even further United centre-backs. In fact, just before Sir Alex Ferguson's charges equalised, Stoke City could have gone two goals up and hardly anyone would be surprised. 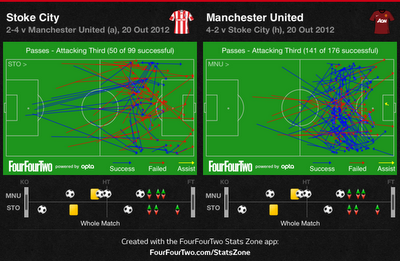 While they enjoyed only 36% of possession, they were much more incisive for the better of the first half. 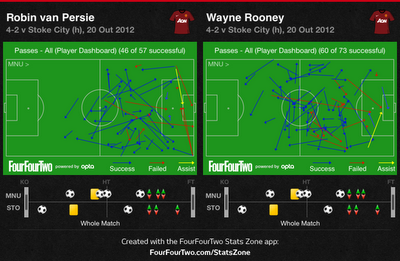 Manchester United started to pick up their stride when their attack became more fluid. With Van Persie, Rooney and Welbeck on the side, the three of them may exchange positions almost at will, something that they failed to do for 30 minutes. Van Persie gave the example by drifting more and more to the left, leaving the middle for Rooney to come up from behind, which would end up yielding the first goal. These three players would end up scoring and providing the assists for every Manchester United goal (except Valencia's assist for Van Persie' goal). Of these, the Dutch forward was the most dangerous and harder to mark, since he kept wandering through various positions, forcing his team-mates to seek other areas. Welbeck proved once again he is better when coming inside and Rooney proved once again that he is an all-around player, with the talent to play anywhere he wants. There is still time for one final thought for each team. 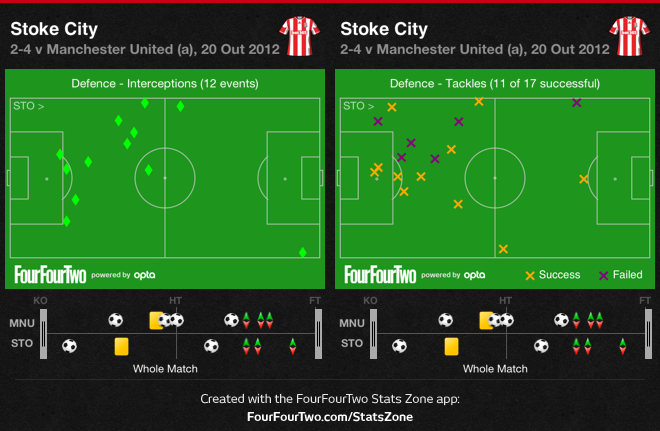 Stoke City's second goal showed once again that Manchester United have to address the need for a better, more competitive defensive player in their midfield and to work on covering their frailties down the middle - Stoke's second goal is oddly similar to how Tottenham destroyed United a few weeks ago. As for Stoke, while this approach may bear fruits against stronger opponents, a more elaborate plan will be needed if they are to climb up the table.